1.25" x 1.00" direct thermal, removable paper label on a 1" x 4" core. 1500 labels per roll / 8 rolls per case. BCW Quick Remove 1141350 special features - Perforated. No ribbon required. 1.50" x 1.00" direct thermal, removable paper label on a 1" x 4" core. 1500 labels per roll / 8 rolls per case. BCW Quick Remove 1141450 special features - Perforated. No ribbon required. 1.56" x 2.38" direct thermal, removable paper label on a 1" x 4" core. 625 labels per roll / 8 rolls per case. 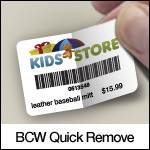 BCW Quick Remove 1141525 special features - Perforated. No ribbon required. 2.00" x 1.00" direct thermal, removable paper label on a 1" x 4" core. 1500 labels per roll / 8 rolls per case. BCW Quick Remove 1142100 special features - Perforated. No ribbon required. 2.00" x 1.25" direct thermal, removable paper label on a 1" x 4" core. 1250 labels per roll / 8 rolls per case. BCW Quick Remove 1142125 special features - Perforated. No ribbon required. 2.00" x 2.00" direct thermal, removable paper label on a 1" x 4" core. 800 labels per roll / 8 rolls per case. BCW Quick Remove 1142200 special features - Perforated. No ribbon required. 2.25" x 0.50" direct thermal, removable paper label on a 1" x 4" core. 2750 labels per roll / 8 rolls per case. BCW Quick Remove 1143050 special features - Perforated. No ribbon required. 2.25" x 0.75" direct thermal, removable paper label on a 1" x 4" core. 2000 labels per roll / 8 rolls per case. BCW Quick Remove 1143075 special features - Perforated. No ribbon required. 2.25" x 1.25" direct thermal, removable paper label on a 1" x 4" core. 1250 labels per roll / 8 rolls per case. BCW Quick Remove 1143130 special features - Perforated, 2-Across. No ribbon required. 2.25" x 3.00" direct thermal, removable paper label on a 1" x 4" core. 500 labels per roll / 8 rolls per case. BCW Quick Remove 1143300 special features - Perforated. No ribbon required.